You can’t actually buy this fabulous creation at the supermarket, but it was made using Asda’s flowers from their Valentine’s Day range. Any regular readers of my blog will probably remember I’ve discussed florist flowers versus supermarket offerings before. My general feeling is that you are always better off going to an expert and buying flowers from a florist shop. But I do admit Joe Massie has made these flowers look fantastic. Joe is the RHS Chelsea Young Florist of the Year, an accolade he has held for the past three years, an amazing achievement for someone only 23 years old. Joe and his team of florists painstakingly attached petals and flower heads to the design; it took 170 hours to perfect the dress and weighed nearly two stone when complete. 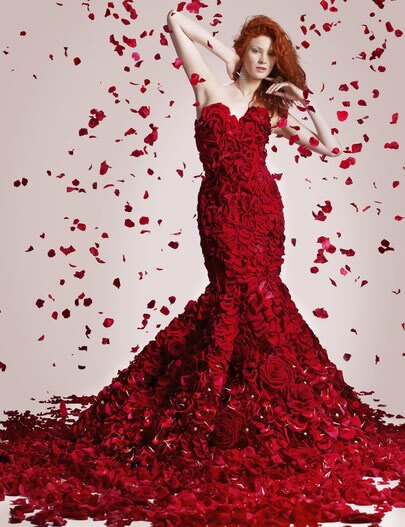 The gown contained 1000 Red Naomi roses, a large headed variety packed with velvety petals. 15 beautiful Carmen roses were dotted throughout the hip and skirt part of the design. 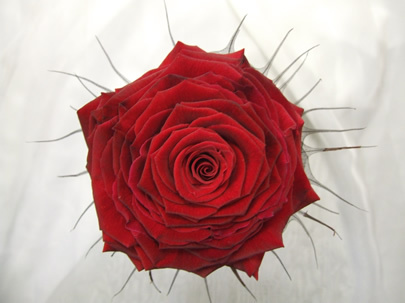 Carmen roses are made by deconstructing several roses and then assembling petals around a rose head to form a very large rose. The bottom part of the dress and hem contained 150 Purple Power roses, 300 carnations and 75 gerbera. As well as 200 red chrysanthemums adorned with gold leaf. Joe’s creation has caused a bit of a controversy in the florist world. Undoubtedly the dress is fantastic and highlights the creativity and skill involved in floristry. He said “I’m so proud of what we have achieved with Asda’s stunning flower range. I hope it inspires people to treat their loved ones with an extra special bunch of flowers this Valentine’s Day.” But by saying this is he is endorsing Asda’s flowers to the public. Supermarkets are the bane of a florist’s life, often selling flowers for less than florists can buy them for. So working with Asda in this way and promoting their flowers is almost blasphemous to some florists. Currently lots of small retailers are struggling and florists are no different. Valentine’s Day is one of the periods florists rely on to help balance out quiet periods such as October and November. It can also be a risky business for florists, as stock can cost up to 50% more than usual. Florists have to order their roses well before customers order them and many don’t order at all, preferring to buy on the day. From a florist’s point of view I am undecided. I feel for Joe, he’s a talented young florist, who was offered an amazing opportunity and created a magnificent design. But working with a supermarket, it goes against the grain. Who knows what they would do in the same situation. What would you do? I do agree with you on a lot of what say, Joe is an exceptional florist, I bet you would never catch him buying his flowers from any supermarket though. I think you have not got the price hike of flowers quite right, Yes the majority of flowers cost at least 50% more on valentines but my roses in particular my Red Naomi have cost me approx 150% more this week than I paid two weeks ago, also the roses used by Joe are not available in any asda store that I know of, yes they sell red naomi but when do you ever see 80cm red naomi in the supermarket ? and not from the same grower that is used in the advert either, yes they have put up the money for this but I very much doubt they even sourced the flowers, just a guess but im betting that Joe ordered his own and asda put the money up for it, still it is just a guess and not based on fact. Made a slight mistake with my calculations on the rose price lol, my roses cost me nearly 3 times what I normally pay so thats an increase of 300% not 150%. Yes it was a good opportunity for a talented young Florist, but these flowers were undoubtedly imported, and not just from Holland, but probably much further afield, where flowers are grown with vast of amounts of chemicals, banned in u.k growing, and without regard for the workforce who work in often dreadful conditions, for very little money. People who buy flowers from supermarkets/garage forecourts etc. need to be made aware of where their flowers are produced, in the same way as we have been made aware of where and how our food is grown. Florists, and growers, like myself, must start promoting British cut flowers, and supporting the use of more seasonal offerings. Flowers grown here in the u.k. have traceability. There are Organic growers, myself included, so NO Florist has to worry about handling pesticide laden blooms. Florists can visit flower farms and actually SEE how they are grown and handled after cutting. Imagine, as a Florist, being able to walk the flower fields, picking and choosing the flowers you will fill your shop with each week! And as for variety, well, we British growers have a staggering amount of material on offer, for nigh on ten months of the year! No air miles, carbon footprint, and far less packaging than offered from growers outside the u.k.
Another point is that if florists use local growers, there is rarely a minimum order amout ….so if you only want to buy ten stems of three varieties of flowers, for instance, then the Florist is not penalised financially. Florists and growers need each other. We are mutually beneficial to each others business. Given enough support, British growers can help enormously to take some of this business away from Supermarkets. People who buy beautiful British grown seasonal flowers, with scent (not much scent in most supermarket bunches) even though they may cost slightly more, will keep coming back for more. So I think, being young, and ambitious, Joe gave little or no thought to supporting Florist Flowers…. £££ signs are very poowerful! FBA I agree it’s unlikely Asda sell the same quality Red Naomi used in the dress, their website doesn’t state the length of the roses they offer. Mandy I love using British flowers and it’s good to know you are supporting local growers by buying British. I think the public is not aware of the many negative points regarding supermarket flowers, including how far they travel to reach the consumer. I have blogged several times about gorgeous British flowers and the benefits of buying from a real florist.